There is excessive sediment or minerals in the aquarium water. Immediately After Setup: If cloudy aquarium water occurs immediately after tank setup, then the aquarium gravel may not have been rinsed properly and dust from the gravel has made its way into the tank. Soon After A Tank Is Started: If cloudy aquarium water occurs a couple weeks after a tank is started, and after fish and food are being added, then the issue may be a bacterial bloom caused by a buildup of organic material in the water. Cloudy aquarium water at this stage is often considered to be part of “New Tank Syndrome”. After A Water Fill Or Partial Water Change: If cloudy aquarium water occurs after the initial water fill, or after a partial water change, then the issue may be from heavy sediment or minerals in tap water. After A Tank Cleaning: If cloudy aquarium water occurs after a tank cleaning, after a filter cleaning, or after stirring up aquarium gravel or substrate, then the issue may be the result of an excessive release of organic materials into the water column, and a bacterial bloom that follows. 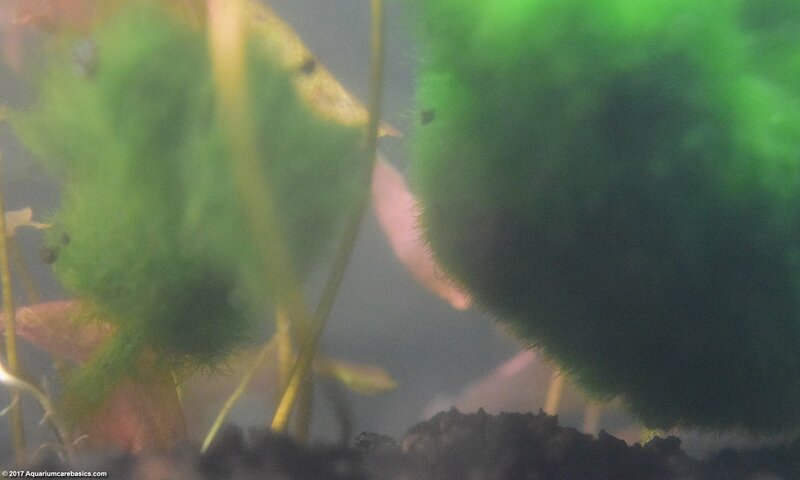 A cloudy freshwater aquarium is often the result of a bacterial bloom occurring because of excess dissolved organic materials in the water column. Organic material can come from fish waste or excrement, uneaten fish food, dead plants, dead fish, dead snails or other detritus or debris. Organic materials can also exist in water coming right out of the tap. Therefore, it’s good practice to keep an aquarium clean and free of excess waste to prevent the buildup of organic materials to levels where they become problematic. Heterotrophic Bacteria: Friend Or Foe? An aquarium contains certain types of heterotrophic bacteria that exist naturally in nature. Heterotrophic bacteria are very flexible and can multiply very quickly. Heterotrophic bacteria can live in both high oxygen and low oxygen environments. This bacteria can also be facultative, meaning it can change states and live with or without oxygen all together. Heterotrophic bacteria can live in aquarium gravel or substrate, as well as in the water column itself. A certain amount of heterotrophic bacteria are necessary and beneficial in a tank as they help break down fish waste. When heterotrophic bacteria are left alone and undisturbed in aquarium gravel or substrate, they go unnoticed, quietly doing their job breaking down waste. Heterotrophic bacteria become a problem when their population grows rapidly to feed on high levels of organic materials dissolved in the water column. This sudden heterotrophic bacteria growth is known as a bacterial bloom, causing white cloudy aquarium water. A bacterial bloom consumes large amounts of oxygen from aquarium water, so from the onset of a bacterial bloom make sure the tank gets additional aeration. Also, a bacterial bloom may coincide with rising Ammonia levels, so be sure to routinely check for Ammonia spikes. When new aquarium hobbyists see cloudy aquarium water, many are tempted to do frequent and large water changes, or worse – start massive aquarium cleaning and scrubbing sessions. Changing large amounts of cloudy aquarium water with clear dechlorinated tap water may temporarily clear a tank somewhat. But unless the levels or organic materials are reduced, the fast multiplying heterotrophic bacteria will quickly return, causing a new bacterial bloom. Within hours, the new tank water will be cloudy and hazy white again. That said, it may be a good idea to do a partial water change for the purposes of removing some organic materials from the tank: for a gentle gravel vacuuming, or to siphon out bits of floating waste. Another good reason for a partial water change is to keep ammonia levels down. Unless excess organic materials are removed, a partial water change will not clear cloudy water over the long term . The better way to deal with cloudy aquarium water is to remove excess organic materials that are causing the bacterial bloom. First of all, remove excess uneaten fish food, dead fish or dead snails and dead or dying aquarium plants. In addition, delicately lift fish waste, detritus, or debris from the gravel or substrate. Carefully swish out the aquarium filter with tank water. Gently rinse out aquarium filter media in a bucket of tank water. It’s important to be delicate when lifting waste from the bottom of the tank. Use a net to gently scoop out as much of the floating debris as possible. Fan the net gently over waste laying on top of the gravel. Create a current to lift heavier detritus off the bottom and into the net, then remove it from the tank. If an aquarium gravel vacuum is used, try not to overly disturb the bottom, as this could release more organic waste into the water. And follow up by gently moving the net through the water to remove any floating debris. Along these lines, be careful when cleaning excess organic materials from the aquarium filter or filter media. Be sure to not accidentally release more fish waste back into the tank while cleaning. And take care to not damage or destroy the anaerobic nitrifying bacteria in the filter box or filter media. Damaging or destroying an aquarium’s biological filter may cause a mini-cycle or a full blown aquarium cycle…further complicating matters.